Method offers a variety of video conferencing and multimedia options, including Highfive. Highfive makes a beautifully designed device for the meeting room and easy-to-use cloud software for personal devices. Highfive is the first video conferencing solution designed and priced for every room and every person, across an organization. Highfive enables everyone to work face-to-face no matter where they work. Today, Highfive offers a single solution for web conferencing, Video Conferencing and screen sharing. You can use Highfive for conferencing by joining a call via the all-in-one in-room device. 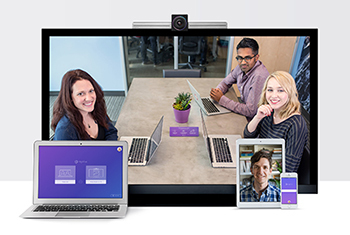 For web conferencing, Highfive’s cloud software supports calls between computers and mobile devices. And Highfive can be used for screen sharing from your computer during a web or video conference. Highfive is so easy to set up and use, you'll forget how painful video conferences used to be. That's why we at Method Technologies are a proud partner of Highfive, installing and building video conference systems at companies throughout Southern California. Unlike legacy video conference systems, Highfive offers an affordable and accessible solution. Method offers installation of Highfive devices and software, training for your staff and video configuration for your entire office. The integrated Highfive hardware and software include a video device with a high-fidelity microphone, a HD camera and mobile chip that sits atop a TV. The microphone array can reach up to 30 feet, and audio is piped out through the television speakers. The entire system is purpose-built and carefully tailored to work together. There is no remote involved, making the Highfive system simpler to operate than others in the market. Users control the system with their computers or mobile smartphone devices. The video conference device has recently won a number of awards, including the prestigious Red Dot Product Design Award for 2015, along with G-Mark and iF Design award honors. TV: 1080P flat-panel display with an open HDMI port. Room: Max room size: 14'x22' with DHCP-enabled Ethernet port near TV. Outgoing access for TCP/UDP traffic to port 5005. Outgoing access for TCP traffic to ports 80, 443. Video is sensitive to four markers of network health: bandwidth, latency, jitter, and packet loss. You can test your network using this article before you start using Highfive. Bandwidth minimum 500 kbps up and down per customer, HD video 2.5 Mbps. For multipoint we recommend a minimum of 1.5 Mbps. For latency, a healthy Min is ≤50-70ms and healthy standard deviation is ≤ 30ms. The higher the roundtrip time, the less likely you are to have a smooth call. Jitter should stay under 8ms. Healthy packet loss is ≤ 1.0%. Windows 7/8, 2.5G Core i5, 4GB RAM, webcam. Mac OS X 10.8/9/10, 2.5GHz Core i5 (i7 recommended), 4GB RAM, webcam. We do not currently support Linux or ChromeOS (Chromebooks). You can optimize CPU by closing applications running in the background and plugging in your computer to power. Full Highfive experience - iPhone 6/6 Plus, iPhone 5s, iPad Air, iPad mini w/retina. Audio-only experience - iPhone 5c, iPhone 5, iPad mini, and iPad 4th generation w/retina. We do not currently support Android devices. Web browser:Supported web browsers include the latest versions of Internet Explorer, Safari, Firefox, Chrome. We recommend you use Highfive over wi-fi. 1Mbps up/down per endpoint (2Mbps up/down recommended). Antivirus: Some antivirus applications may require creation of exceptions for the Highfive installer. Yes! I am interested in Highfive.